The jubilant excess of the Christmas period usually sees us stocking up on wine for all the festivities. Moving on from this period, you may find yourself with many bottles of unopened and unfinished wine. Rather than letting this go to waste, Ideal Wine Company has plenty of tips to put your leftover wine to good use. You may find yourself with many bottles of unopened and unfinished wine. Here’s how you can put your leftover wine to good use. 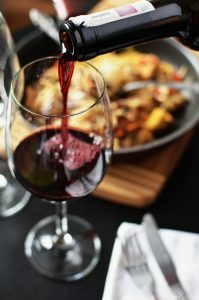 When it comes to leftover red wine, its best to remember that you can still drink it for up to 5 days. But after this, it’s time to repurpose that wine for better use. Here are a few options we use to prolong the life of our favourite reds. Boil it – ideal for sauces: A standard tip for leftover wine, but a useful one. Try boiling down your red wine until it is concentrated. From here, pour the mixture into ice cube trays to make handy portion sizes and freeze. This means that you have red wine handy to add to your sauces throughout the year without having to open more bottles and create waste. As well as saving wine, giving your sauces a depth of flavour is made simpler. Poach with it – perfect for leftover fruit: If you find yourself with leftover fruit, poaching it in wine creates a simple yet delicious dessert. Pears and prunes, for example, are great vehicles for a good red wine. Mull it – brings new life: Mulling your red wine will undoubtedly uplift your old wine into something enjoyable again. The addition of spices brings a warming quality to your red, while the citrusy notes keep it interesting. Cook with it – great for leftovers: With all the meats at Christmas, many of us choose to make a casserole with the leftovers. A good slosh of red wine can liven up any dish and bring new life to your food. White wine can last up to 7 days once it’s open but can turn brown or take on a vinegary taste after this. Therefore, it’s best to act sooner to avoid this. The same principles of red wine generally apply to your leftover white wine. 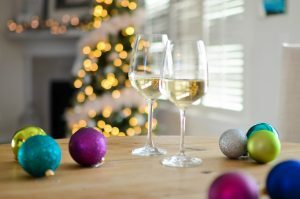 It’s worth remembering that white wine generally pairs better with lighter food, so here are a few tips on how to adjust these standards for white. Leftovers – stick to white meats: While white wine can work well with different hot meats, it is best to stick with white meats like turkey when cold. This lightness works well with a delicate meat, but may be overwhelmed by red meats. This same rule applies if you are making a casserole or pie out of your leftovers. Cooking with it – wonderful with fish: As the new year comes around and we try to be healthy, a lot of us may see an injection of fish into our diet. When cooking fish, a splash of white wine can bring acidity and zesty flavours. Your leftover white would be useful here. While this may be the wine of choice around the festive season, it can be hard to know what to do with leftovers. Champagne can last up to 5 days after opening, while Prosecco is good for a shorter period of 3 days. Proper storage in the fridge with a cover is key and you should act fast. While sparkling wine can follow the advice of white wine, it is not a great showcase for the wine. Try making a delicate jelly with your leftover sparkling wine. This still gives the flavours a chance to shine, while prolonging the life. In general, the golden rule to remember with using leftover wine is how much did you enjoy it. If it is leftover because no one liked it, it’s not worth saving. Similarly, if it has gone bad and the flavours have changed dramatically, it may be beyond saving. If you choose to start cooking with wine this year, you can use this incredibly versatile product to whip up everything from mouth-watering mains to delicious deserts. In order to help you develop your wine-based cook book, here we reveal four amazing wine desert recipes for you to try in 2017. If you want a light after-dinner dish, try wine-soaked pairs. Browse our Bordeauxs list, to find the full-bodied red this dish requires. You’ll need three cups of red wine, four pealed pears, half a cup of white sugar, juice from half a lemon, a split, seeded vanilla bean and a cinnamon stick, broken into half. Start by pouring the lemon juice over the pears. Place the wine, sugar, vanilla bean and cinnamon stick into a small sauce pan and bring this mixture to boil. Add the pears in and let them simmer in this mixture for about 30 minutes and then let them cool. Finish by simmering the remaining mixture until it is reduced by half and then pouring it over the pears, to make a delicious dish which serves four. You can use wine to make a range of scrumptious cakes. If you’re feeling particularly decadent, you may want to opt for Champagne cupcakes. You can find top Champagnes from Ideal Wine Company, with our list featuring brands such as Dom Perignon. To make a batch of 20 cakes, you’ll need six egg whites, a three quarter cup of Champagne, one and a half cups of white sugar, a two third cup of butter, one tablespoon of salt, three tablespoons of baking powder two three quarter cups of flour. You’ll also need to make Champagne buttercream icing. This requires three tablespoons of Champagne, half a teaspoon of vanilla, a cup of butter and a three quarter cup of icing sugar. Start by preheating your oven to 175°C and putting cake cases into a cupcake pan. Cream the butter and sugar in a large bowl until fluffy, before sifting the flour, baking powder, salt and Champagne in. In another bowl, beat the egg whites until they form stiff peaks and fold a third of these whites into the batter. After this, fill the cupcake cases with the batter until they are two thirds full and then bake your cakes for around 20 minutes. Now turn your attention to the icing. You should start by beating together the icing sugar and butter with an electric mixer. After this is well-blended, add in the Champagne, before beating for another minute and then apply this icing to the cakes, to create unique little treats! In summer, go for something that’ll cool you down, like wine popsicles. For this recipe, we’d suggest that you buy a bold Cabernet red wine. You’ll require three cups of red wine and water respectively. You’ll also need half a cup of white sugar, a cinnamon stick, eight black, crushed pepper corns, six whole cloves, four crushed cardamom pods and a two inch strip of orange zest, to make ten popsicles. You should begin by heating the wine, orange zest, sugar, cinnamon, peppercorns, cloves and cardamom on a medium setting. You should stir the mixture and lower the heat, to bring it to a simmer, reducing it until you have a cup’s worth left. Then, remove the mixture from the pan, let it cool for 20 minutes, add the cinnamon stick, stir in the water and pour it into moulds. After this, you should add a popsicle stick to each one, before letting them freeze overnight and then voila! For something filling, try red wine doughnuts! You’ll need a quarter cup of cocoa, sugar, milk, red wine and chocolate chips each. This recipe also requires a cup of flour, a tablespoon of baking powder, one egg, a pinch of salt, three tablespoons of apple sauce, a tablespoon of canola oil and a teaspoon of vanilla. You should also have half a cup of chocolate chips and gold sprinkles for the chocolate glaze. Before preparing the recipe, preheat your oven to 230°C and grease a doughnut pan. Then, mix together the cocoa powder, baking powder, salt, sugar and flour, before adding in the red wine, vanilla, apple sauce, canola oil, milk and egg. You should stir this mixture and then add in the chocolate chips, before pouring this batter into the pan and baking for roughly ten minutes. After this, melt down the chocolate chips and add the sprinkles to create a glaze which you can brush over your doughnuts! With these four recipes, we’ve only just gotten started. You can browse various sources, from wine blogs such as Vine Pair to recipe sites like BBC Good Food, to discover a range of delicious wine dessert recipes to try. You may want to buy the wine needed for these dishes from Ideal Wine Company. With us, you can find fine wines from regions like Australia, Bordeaux and California at great prices!